If you only take gravity into account there is a stable zone inside the orbit of Mercury from 0.08 to 0.21AU where asteroids would be able to exist without being perturbed. But gravity is not the only force involved. There is an influence called the Yarkovsky effect which can change the orbits of small asteroids. Basically what happens is that the temperature of different parts of the asteroid vary because of their rotation, irregular shape or position in its orbit (season). The warmer areas radiate more heat, which exerts a small force on the asteroid. Over millions of years this force will gradually cause the asteroid to spiral inwards or outwards. Near in to the sun the effect is stronger so the Yarkovsky effect will have cleared that area of the solar system long ago. Only large objects like Mercury, which require a huge force to accelerate them, can remain there. That's interesting about the Yarkovsky effect. I never thought about it before, but you're right, it would be huge near the Sun. Perhaps if an asteroid is rotation-locked to the Sun then Yarkovsky won't be significant. There's also the Poynting-Robertson effect, but I think it is less significant than Yarkovsky. Even then there would still be a small outward force because the sun-facing hemisphere would be warmer than the dark side. If the orbit has any sort of eccentricity then libration will play a part as well. If you only take gravity into account there is a stable zone inside the orbit of Mercury from 0.08 to 0.21AU where asteroids would be able to exist without being perturbed. .
Do you have a source describing this stable zone ? In the Baut forum someone made the remark that in 2006 the asteroid 2004XP14 made a close pass to Earth , even closer than the present 2007TU24 asteroid . Heres a simulation of the asteroid ( backwards running ) . The view was taken from our sun , pointing to Earth . One dot represents the position of the asteroid in 0.5 hours. The deflection of the asteroid is very clear . As mentionned retrograde orbits for asteroids are very uncommon . Here's one example of the few that are known today : the asteroid DIORETSA ( please read the name from right to left ) . The asteroid was discovered in 1999 and is supposed to be a captured Kuiper Belt object . It nowadays has a period of 114 years , is retrograde ( therefor its name ) and has a very elongated orbit bringing it almost as far as Pluto . The inclination is about 20° . The orbit is very unusual . It has now some resonance properties to Pluto ( 1:2 ) and also to Neptune . The most remarkable feature however is its orbit instability . In its orbit it "crosses" Neptune , Uranus , Saturn and Jupiter . Here's a simulation covering 100.000 years forward . The innermost orbit depicted is Jupiters orbit . Screenshots were made every 1000 years . As can be seen above the asteroid DIORETSA is almost ejected around 61.000 years. The eccentricty keeps rising from 0.9 (now ) to almost 0.99 at 100.000 years . I think a "close" encounter to Jupiter is the reason . The asteroids orbit from aside can be viewed hereunder . The outermost orbit is Pluto's orbit . Remarkable in the animation above is the asteroids strong precession of aphelium ( counterclockwise , regardless of its retrograde orbit ) . The precession rate seems to be proportional to the period as the asteroid hardly shows precession at the end of the simulation . The asteroids also seems to evolve to an orbit period of more than 1000 years ! In my simulations using Mercury ejection really happen after 126.000 years. And a close encounter with Jupiter ( at 0.05624548 AU ) after 43.236 years is the reason for the ejection. Annex the file of the close encounters with Jupiter and the evoluiton of the orbital elements of Dioretsa. thanks for the annexes . Nice output file . What mass did you assign to the asteroid ? Edit : reason I ask this is the fact that I have changed the asteroids mass from arbitrarely 7e+10 to 70 kg and noticed that after 21000 years has a very close encounter with Neptune , throwing it into a very eccentric orbit . The asteroids path is very sensitive I think . I use mass=0 cause the mass diference between asteroid and planets are to big to be considered. But I will try new simulations with the mass that you test. I will post the results here tomorrow. Here's the screenshot of the approach in 21.000 years , viewed from above and aside . 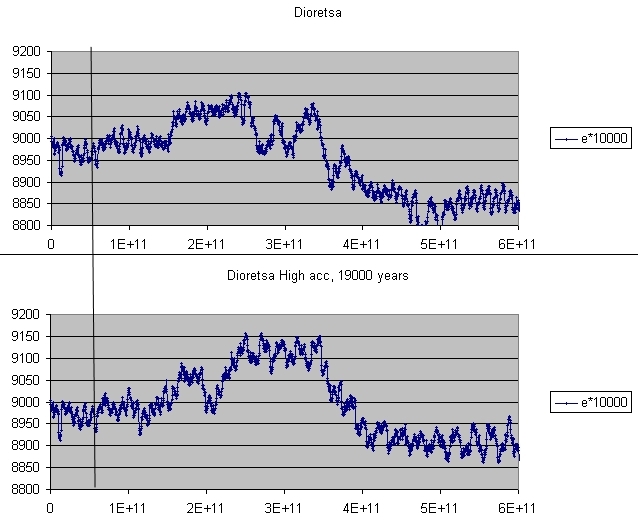 I made a simulation of Dioretsa evolution with the mass of 700 kg. The simulation shows some modifications: Dioretsa are ejected after 70371 years after a close encounter with Jupiter but it don´t show the great and abrupt changes of your simulation. Maybe this variations are because the sensibity of the initial conditions ( the chaotic component of the orbital dynamics ). I think the orbit of dioretsa is very sensitve to perturbations ( initial settings ) and the accurancy of calculations due to the fact that the asteriod orbits in a very elliptical orbit and has numerous encounters with the major planets . I ran the sim again with the picard integrator once with an accurancy of 10 meters per iteration ( one interation is about 10000 hours ) and later with an accurancy of 1 meter per iteration . The result after many years is completely different as can be seen in the following picture of the eccentricity evolution. Time in seconds . One can see that the eccentricity in both runs matches for some time . This corresponds to about 2000 years , or about 200 revolutions . Earth got a visitor some days ago : rock 2008FK flew by at 0.8 Lunar Distances . In the next days 2008FP is expected to come as close as 0.4 LD . Both can be seen in the following animation . Vieuwpoint is the sun . One dot represents one hour .